Famed quarterback for the Carolina Panthers, Cam Newton is one of the league’s superstars. While his team did lose to the Denver Broncos during Super Bowl 50, Cam Newton is the reigning NFL’s MVP. Moreover, he has a slew of accolades to his name. The stellar football player doesn’t only make headlines because of his skill on the field but for his unique personal style too. 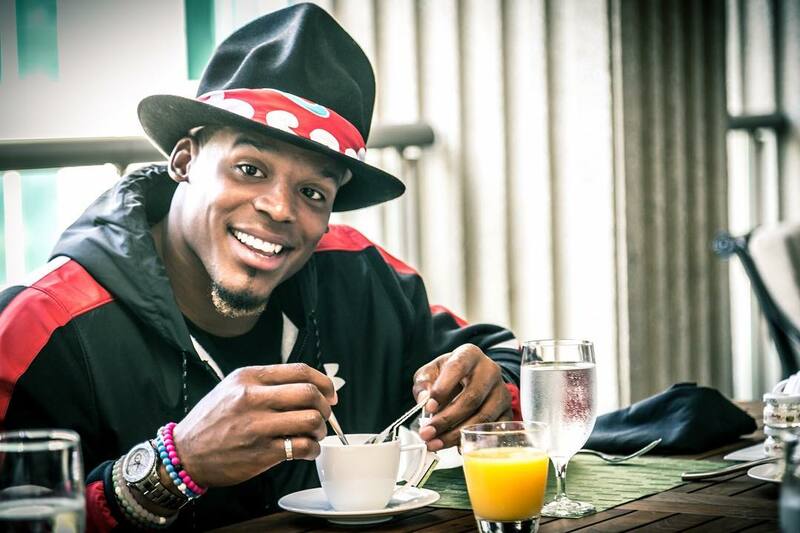 Flaunting a love of color, outlandish hats, and fashion-forward outfits, Cam Newtons tops it all off with some serious watches too. Among his collection of ultra-high-end timepieces are some noteworthy Rolexes including two Yacht-Master II models and the iconic Day-Date. »•>büšįñëššÅŠüšüâl<•« #iWmW -1OVE #këëpPØŪND1NG #whÿŠØšërįöüšMÅR1Ø⁉️? Cam Newton doesn’t just have one Yacht-Master II in his collection, but we have seen at least two models on his wrist: the yellow gold Yacht-Master II ref. 116688 and the white gold and platinum Yacht-Master II ref. 116689. Both ultra luxurious, the gold versions of the technically advanced and aesthetically bold Yacht-Master II are watches that command attention. Sized at 44mm, the Yacht-Master II watches are some of the biggest available within Rolex’s lineup. The yellow gold Yacht-Master ref. 116688 features a blue Cerachrom ceramic bezel while the white gold Yacht-Master II ref. 116689 is equipped with a solid platinum bezel. In addition to their striking looks, the bezels on the Yacht-Master II watches are also notable for their control over the movement within. Dubbed the “Ring Command Bezel”, turning the bezel on the Yacht-Master II operates the programmable countdown timer of the Rolex Caliber 4161. This unique mechanism makes the Yacht-Master II one of the most technically advanced Rolex watches to date. In contrast to his Yacht-Master II sports watches, Cam Newton also has the dressier Day-Date within his watch collection. The quintessential high-end dress watch, the Rolex Day-Date a.k.a. the President is the epitome of prestige, excellence, and luxury. Cam Newton’s Rolex President of choice is a full 18k yellow gold Day-Date II model. The quarterback graced the cover of the September 2016 issue of GQ where he was seen wearing his gold President inside the men’s fashion mag. Although no longer in production, the Day-Date II is still a popular choice among the Rolex President models due to its larger 41mm size. Naturally, it sports the characteristic design traits of the collection including the three rounded links of the President bracelet, in addition to the day of the week and date windows on the dial. Of course, on top of the sapphire crystal protecting the dial is the iconic Cyclops lens to magnify the date. Furthermore, Cam Newton’s Rolex Day-Date II includes a champagne dial for a sleek monochromatic style. A man of many hats, Cam Newton’s personal fashion style is one that takes risks. Never shying away from the limelight, it comes as no surprise that his choice of Rolex watches includes some of the most luxurious available.